I don’t know about you, but as a FileMaker developer, I have about 12 usable hard drives in my house. I don’t seem to ever get around to reconciling them so that I can stop buying hard drives for a while. I was getting into the project last night because I have a misbehaving 1 terabyte drive I need to exchange. That means I need to move a terabyte somewhere else temporarily. To do this, I need to eliminate 1 terabyte worth of redundancy in a hurry. 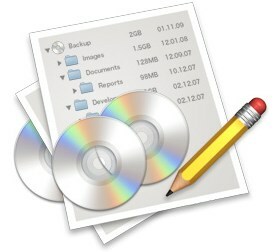 So, I figured, I’ll create a FileMaker database: a table called hard drives and a table called folders. I looked in Automator to see if it would take a folder and give me a list of its contents as text. Let me know if I missed this. I can’t imagine someone hasn’t added this to an automator script but I couldn’t find one on short notice. That lead to me typing in about 50 folders and a couple drives. NOT! Today is a new day, and I wanted a utility to give me the contents of a drive as a text file. Voilà, I found one called DiskCatalogMaker and it works great. Prints catalogs. It’s fast too. You get 60 days to try this out with full functionality so that’s where I am with it for now. MacDiskCatalog is a nice little Cocoa app. VERY straightforward. You select Scan and it gives you an open dialog. You select a hard drive and it scans that sucker into its own catalog in 3 minutes or so for maybe 300 gigs of files. Then you have a nice and handy export to text button. 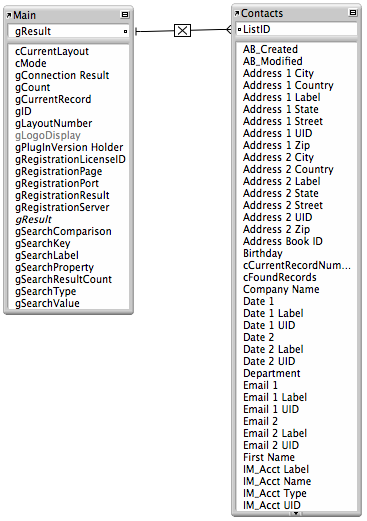 It creates a tab-delimited (I think) file with 5 fields: Name, Size, Type, Creator, Date Modified. I just dragged and dropped the exported text file onto FileMaker Pro 9 Advanced and it gave me the option to use the first row as field names – choose yes. I wound up with a 179 mb file after I had done some Finds and Replace commands on it. Name is the full file path with the file name at the right of that path. I got rid of the hard drive as part of the path for my current purposes and put that name into its own hard drive field. I can always create a calculation to get that drive name back into the path if I need it. From here, I’ll do a bit more cleaning and perhaps export summary data cause I don’t really want to know all the files on here or at least want to work with less than about 500,000 files for most purposes. If you want to be able to use filemaker to see how many copies of things you have, give DiskCatalogMaker a try! For me this is fun and is a great relief. I might learn something about FileMaker 9’s capabilities when handling a 1/2 million records at a time along the way. Remember, I got a lot more hard drives left to do but it is going to be very fast to get them in here. Now that I have my hard drive files and directories safely in FileMaker, I’m still playing around with DiskCatalogMaker to see what all it can do. If it was smart enough to tell me what to delete without my searching on big folders, I’d be totally sold. As it is though, I’ve got a terabyte I need getting rid of and I think I can use it to guide me to some quick scores. This entry was posted in FileMaker Add-Ons, FileMaker Discoveries, FileMaker Resources, FileMaker Utilities on June 13, 2008 by janet. Wow! I was browsing 3rd party apps over at the FileMaker site and they are featuring AdminAnywhere from 360Works. Looks like a great little helper app for anyone who needs to administer a FileMaker Server and can carry an iPhone or Treo. See my more detailed write-up over on Studio Manager Bulletin. I want my customers to take advantage of this awesome tool. I can especially imagine all my IT guys and gals using this. They like to do IT things by mobile. Click to see the photo full-size. I know for a fact that no card-carrying iPhone or Treo owner is going to pass this opportunity up. Did I mention that it’s only $49? Have fun! This entry was posted in FileMaker Add-Ons, FileMaker Discoveries, FileMaker Resources, FileMaker Utilities on June 10, 2008 by janet. Productive Computing has just released version 2 of their Address Book Manipulator plug-in. They’ve done a lot of work to make it easy for the rest of us to talk to Address Book from our FileMaker databases. With the help of this plug-in, you can push a record to address book and you can pull an Address Book record into FileMaker. One of the buttons available on the Pull tab is All Contacts. That lets you pull every Address Book entry you have into the demo FileMaker file. With the demo! I just imported all 1588 Address Book entries I have in my Address Book into the demo file. I could now import this data into the FileMaker file of my choosing. That’s great for starters. But the most important functionality here is that you can keep the two in sync by moving data from Address Book to FileMaker or FileMaker to Address Book depending on where you happen to enter the data first. Because Productive’s plug-in is probably written in a low-level language like C, performance is, as they say, lightning fast. Also, I’m running on a MacBook so I am also getting the benefit of the fact that this is a Universal plug-in that works optimally on both PowerPC and Intel processors. Here’s the link for their press release dated November 7. The Plug-in is selling for $60 for a single-user license, $270 for a 5-user license and $432 for a 10-user license. If you have a mission-critical FileMaker application in your company or work group that includes a contacts table and you are Mac-based, Address Book Manipulator v2 could be just what you need. A free demo version of the plug-in is available with a full-access demo FileMaker file that can push and pull data and demonstrate various additional functions including search. I’m using it right now. Here is what the relationships graph looks like. On the left is a *viewer* table and on the right is the *data* table where the contacts are stored in flat records. 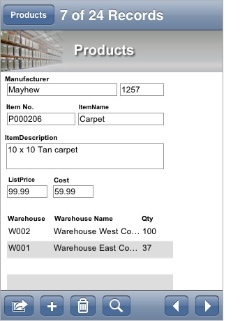 This entry was posted in FileMaker Add-Ons on November 8, 2006 by janet.